Worm farm island! Prevents ants from entering the worm bin! that I have a mega ant factory in my worm bin. 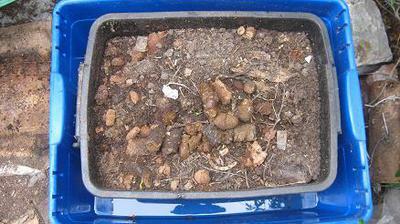 with the worms for the organic waste you are adding to your worm bin. It will give you lots more information about the ant problem in worm farms and offers you a fool proof solution to get rid of ants once and for good! If you have any further questions or replies please fill in one of the interactive forms that you will find at the bottom of most of my pages on that website and I will assist you asap. I wish you continued success with your organic waste recycling project and am looking forward to hear from you. Comments for How to get ants out of a worm farm? Re: Mint leaves in worm farms to repell ants. thank you for your interesting suggestion! I've never tried this method but as a matter of fact I just discovered one of my worm farms (an old bathtub) being full of ants. I do have at the moment as well an surplus of fresh mint growing in my aquaponics grow bed so I will make a test to see how the ants react to a load of fresh mint? Did you put the mint into a bin that was invaded by ants and they left shortly after that? How long did it take for the ants to leave and for how long have they stayed away? Wishing you a great day and God's blessings for you and your family. I discovered this by accident. Put fresh mint leaves in the bins. So far the ants haven't returned.